Cheikh Sallah Cisse of Ivory Coast celebrates after defeating Lutalo Muhammad of United Kingdom. Olympic Rewind: How Did Athletes Featured by VOA Fare in Rio? VOA Learning English featured a number of athletes who were to compete in the Summer Olympics in Rio de Janeiro. During the closing ceremony Sunday night, Rio’s mayor passed the Olympic flag to the city of Tokyo, Japan. 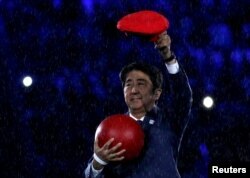 In the highlight of the night, Japanese Prime Minister Shinzo Abe arrived at the Maracanã stadium dressed as the famous video game character Super Mario. Japan will host the next Summer Olympics in 2020. But, it is worth looking back to find out how some of the athletes we wrote about in VOA Learning English performed in Rio. We wrote about refugee athletes from South Sudan who trained at the Tegla Loroupe center in Kenya. Rose Nathike Lokonyen competed in the 800-meter race in Rio de Janeiro. She did not run fast enough to advance out of the preliminary round. VOA Learning English also wrote about some of the Taekwondo athletes from Ivory Coast. There were 50 athletes from the continent of Africa competing in sports like Taekwondo and Judo. Three of them were from Ivory Coast. Ruth Gbagbi was in her second Olympics. She competed in the 67-kilogram division. Gbagbi won her first match against an athlete from Egypt, 4-3. Then, she lost to an athlete from France, 5-4. That meant she could still win a bronze medal if she won two more matches. And she did. Gbagbi defeated an athlete from Azerbaijan 7-1 to win a bronze medal. Ruth Gbagbi won a bronze medal for Ivory Coast at the Rio Olympics. But that was just the beginning of the celebration for Ivory Coast. 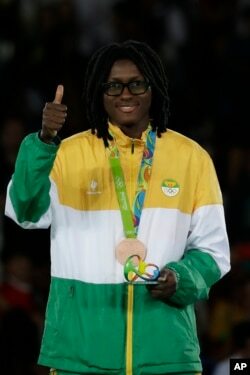 Gbagbi’s teammate Cheick Cisse won the gold medal in the men’s 80 kilogram division. It was the first-ever gold medal for Ivory Coast. Ivory Coast only had one Olympic medal before this year. 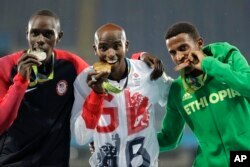 Cisse defeated an athlete from Great Britain 8-6 to win the gold. Learning English also looked at American distance runner Alexi Pappas. She competed at the Olympics for Greece. She trained for the games while making a movie about life in Eugene, Oregon. Pappas ran in the women’s 10,000 meter race. She finished 17th out of almost 40 runners. But she will always be able to say she was on the track during a world record. Almaz Ayana of Ethiopia finished the race in 29 minutes 17.45 seconds to break the world record by almost 14 seconds. Paul Chelimo of Kenya and the U.S. won a silver medal in the 5,000 meter race. VOA Learning English wrote about three runners from Kenya who attended universities in the U.S. When they were finished with school, they wanted to become American citizens. The fastest way to citizenship, they learned, was to join the U.S. Army, so that is what they did. Paul Chelimo, Shadrack Kipchirchir and Leonard Korir are on active duty in the Army, but they are also part of a special program for top athletes. Chelimo qualified for the 5,000-meter race and Kipchirchir and Korir were in the 10,000 meter race. Korir finished 14th and Kipchirchir finished 19th. But in the 5,000-meters, Chelimo won the silver medal. Chelimo finished less than one second behind Mo Farah of Great Britain. At first, Chelimo thought he had won the silver medal. But then he was told that he was disqualified. Officials said he went out of bounds at one point in the race. But after studying video, judges from the International Association of Athletics Federations awarded Chelimo the silver medal. Are you impressed with how this athletes did in Rio? We want to hear from you. Write to us in the Comments Section or on our Facebook page.